Blogging has come a long way since the early days of the Internet. Businesses watched as professional internet bloggers captured views and market share from the comfort of their homes. Now blogging has gone mainstream, and the majority of businesses are creating company blogs. We’ve all heard that content marketing is king and blogs matter. Still, if you aren’t already blogging you might be skeptical. To the uninitiated, blogging seems like hours of unnecessary work and effort that won’t markedly impact on your bottom line. So why should your business start a blog? Ranking is everything. According to HubSpot’s research, 75% of users never scroll past the first page of search results. In the age of instant gratification, being on the first page matters. You don’t want your competitors out-ranking you to capture a larger market share. Blogs give website 434% more indexed pages and 97% more indexed links—in plain English, that means higher rankings for your business. It also keeps your website’s content fresh, which Google’s search algorithms also reward with higher rankings. Sometimes you have to ask hard questions. Are you generating enough leads every month? A blog won’t fix all your problems, but research shows that businesses that blog generate 67% more leads per month. It turns out that a writing habit can do you a lot of good. In a digital world, most product research has moved online. 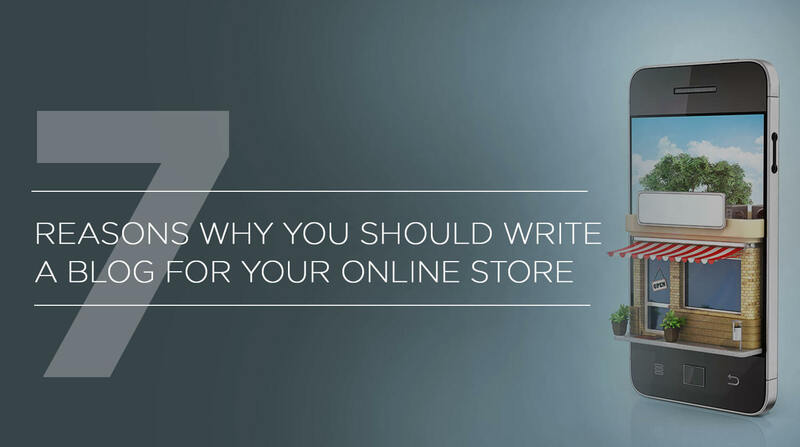 70% of customers say blogs influence what they buy. Before a consumer purchases a product, they’re likely visiting your site and comparing their options. Having an e-commerce blog lets you put your best foot forward, demonstrating expertise and professionalism. An e-commerce blog can start a conversation with potential and current customers. This makes it a great relationship building tool. As customers comment, like and follow your blog they are establishing a relationship with your brand, one that makes them more likely customers. The two-way nature of blogging makes it quite different than impression-based advertising. It’s more cost effective too. According to Search Engine Journal, inbound leads cost 60% less than outbound leads. Blogging is an investment, but it pays huge dividends. People prefer long-form content to advertising. Eight out of ten people report that they ignore Google ads when they appear on the screen. In contrast, they pay attention to articles and blogs. In a connected world, they spread through shares and likes, generating interest organically. Maybe that’s the Content Marketing institute found in a recent survey that 80% of business decision-makers prefer to get to know a company through articles. Longer content gives them the information they really want. An advertisement can pique interest, but content makes the sale. In the past small, local businesses were able to rely on word-of-mouth and foot traffic to generate interest and bring in customers. Now, even small businesses need a web presence to compete. Potential customers are more likely than ever to check your reviews, location, hours, and services online. And just having a website won’t help if it isn’t ranking. The good news is that it’s easier for small businesses to establish a web presence than you think. Yes, it may be hard to rank against large corporations for branded keywords and large search volume terms. However, small businesses can target specific phrases, like “moving service in Ann Arbor Michigan.” With the right content strategy, you can capture your target audience. Small businesses in particular have a lot to fear from bad online reviews. A single bad review can drive away 25% of prospective customers, and sometimes it feels like we have so little control over how people abuse their voices on the internet. There are ways to make lemonade out of lemons and deal with bad reviews in a productive way. No need to fear the occasional disgruntled customer. Still, it certainly helps to already have strong online presence. Give potential customers something else to look at that tells your story how you want it told. Content marketing is time-consuming and requires specific skills. Maybe you want to just run your business, not write a blog that talks about issues related to running your business. That’s okay. In fact, most other business owners feel the exact same way. That’s why the majority of businesses benefiting from content marketing outsource a portion of the work. The important thing is to develop a proactive content marketing strategy with whoever you select. Without one, your business might fall behind before you’ve even realized what’s happening. And while it does take skill to create a successful e-commerce blog, you don’t have to do all the work yourself. There are people who specialize in creating the kind of high-quality content that you need to promote your business. We can help connect you with the customers you want.